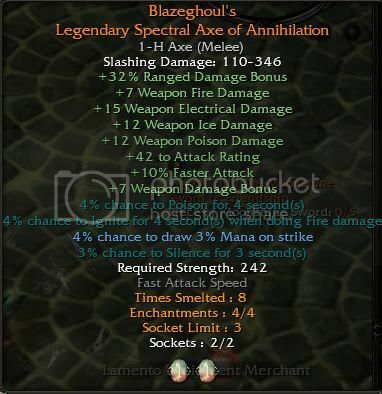 Simple question, for a DPS BL, what gems should i use for 2 slots Sword 1 hand ? There's a lot of different gems, and i don't really know, what's the best choice. ronchileros origin is your best bet but placed in a weapon the bonus is not as great as placing in a trinket. "35+ weap dmg and 49+ STR"
Thats clearly not inlcuding any dmg bonus that may already be on those trinkets. you use the skill blood sleet, something that actually scales with STR. What skill are you planning on using with your weapon of choice. ok ok, so i'm not just talking about STR or BL DPS. In general, what gems should i use on the sword. I think for you, it's definitively skill gems. And gems of vitality / max life ? not good ? Its hard to answer that unless you tell me what skills in general =p do you want to use. it no longer exists due to the Furious Focus tree getting nerfed from Skill to Passive. Tourimaline to increase the attack speed.